Work is becoming a much less pleasant place. From Uber drivers without job security to salesmen whose every move is electronically tracked to accountants expected to answer e-mails at all hours of the day and night, the nature of work is evolving — often in worker- unfriendly ways. As more employers rely on a so-called contingent workforce of freelancers, contractors, and temporary employees, more workers are left without company-subsidized health care, retirement plans, and other traditional benefits. Technology makes it easier for consumers to find restaurants, track daily exercise, and stay in touch with friends, but it has also increased the power of employers to monitor, schedule, and contact workers at all hours. Companies fighting to deliver the next big thing and stay ahead of competitors are also creating a cutthroat workplace culture. At the online retailer Amazon.com Inc., the New York Times recently reported, workers cry at their desks and anonymously criticize each other to management using a special feedback tool, and e-mails not immediately answered at 3 a.m. are followed by text messages. Even some of the so-called perks companies are introducing are less beneficial than they sound. The trend of offering unlimited vacation days, for instance, saves companies money because they don’t have to pay unused time when employees leave — and many workers don’t take off additional days anyway. Opinion: Independent contractors, or abandoned workers? A big issue in today’s sharing economy is that there’s too much riding on the distinction between contractors and employees. Read: Ideas: Is the skills gap real? Read: What’s the state of the American labor movement? Throw in the decline of unions, global competition for jobs, stagnating wages, and eroding retirement benefits, and the average worker faces a far less stable outlook than in the days when someone could get hired by a company and stay there — clocking in at 9 and leaving at 5, getting regular raises and promotions, and collecting a nice pension on the way out the door. Granted, this doom and gloom isn’t universal. Plenty of companies treat employees like royalty, with free lunches and cushy lounges. A few have increased paid parental leave. A number of federal labor protections have been proposed in recent months, such as expanded overtime rights for salaried workers, and advocates for low-wage workers have made headway. In Massachusetts, employees are now guaranteed sick time; in New York, fast-food workers at large chains are poised to make $15 an hour. Despite these advances, many American workers still face a dark future with less job security, more competition, and hostile workplaces, labor specialists say. Technology is largely to blame. Mobile phones tether people to the office, eroding the wall between work and private lives and forecasting a 24/7 work week. Scheduling software calculates how many workers are needed at certain times and alerts managers when business is slow so they can send people home early. That has prompted employers to suddenly alter shifts with little notice to workers. Machines that can build cars, take customers’ orders, and do taxes are taking over many tasks once performed by humans. By 2025, automation will displace 22.7 million jobs, according to Forrester Research, a Cambridge research and advisory firm. And it’s not just factory workers and cashiers getting pushed out by machines. The reams of digital information transmitted through online clicks and social media posts will need to be analyzed and put to use, which would suggest plenty of jobs for smart, tech-savvy people, said Robert Tercek, author of the new book “Vaporized,” about how digital information is transforming the economy. But that work will be done by computers, not humans. 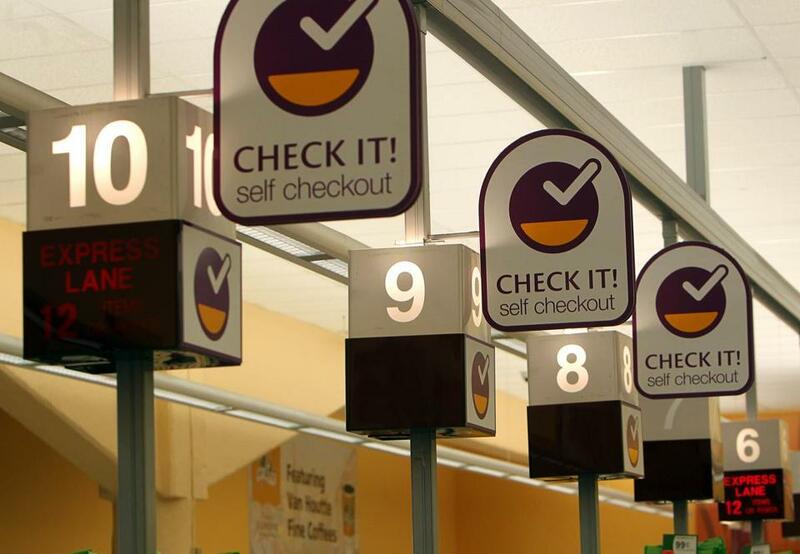 Technology makes it easier to buy groceries or order food but it is also erasing many tasks once performed by workers. By 2025, automation is predicted to displace 22.7 million jobs. Software is also a way for employers to monitor productivity, with programs that track when workers log in, how many hours they spend on specific projects, and where they are at any given time. VoloMetrix, a Seattle startup just bought by Microsoft Corp., analyzes employee activities such as e-mail habits and meetings on their digital calendars. Earlier this year, a sales executive in California sued her former employer, claiming she was fired for deleting an app that her company used to track her whereabouts even while she was off duty — a violation of privacy she compared to “a prisoner’s ankle bracelet.” The company has not responded to media requests for comment. To be sure, technology has helped make workers more productive. But they are reaping few of the rewards that come from producing more in less time, and at lower costs. From 2000 to 2014, net productivity rose by nearly 22 percent, according to the Economic Policy Institute, a Washington think tank. The gain in hourly compensation during that time? Less than 2 percent. Nearly all the benefits of the surge in productivity have gone to top executives, in the form of bigger pay packages; to owners, as higher profits; and to investors, as better returns, the Economic Policy Institute said. The rise of what’s being called the gig economy gives people the flexibility to work when and where they want — a great advantage for many workers. But few of these jobs come with benefits, or a guarantee of steady work. Many workers take them by necessity, not choice. 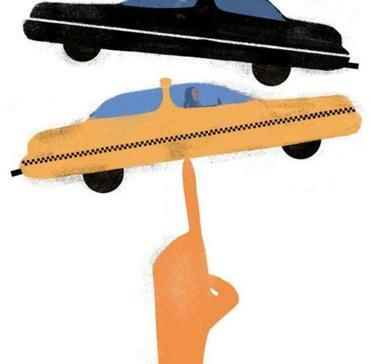 These types of arrangements are growing, and not only with so-called sharing economy firms such as the ride-hailing service Uber or TaskRabbit, which finds labor for daily chores. A recent study by the Government Accountability Office, an independent congressional watchdog agency, found that as many as 40 percent of employed Americans in 2010 were contingent workers — part-timers, temps, day laborers, or independent contractors — up from 35 percent in 2006. These work arrangements, which help companies lower costs and increase their flexibility to respond to changing business conditions, have led more firms to illegally misclassify employees to get around labor laws to avoid paying payroll and unemployment taxes, according to the US Department of Labor. As their leverage continues to weaken, more workers will have to settle for contingent jobs down the road, said Randy Albelda, a labor economist at the University of Massachusetts Boston. And without health care or retirement benefits, this could be a recipe for disaster. Standards that have historically protected workers from exploitation, many of which were passed decades ago, don’t reflect the changing labor market. Several recent regulations have moved to expand workers’ rights: making millions of salaried workers eligible for overtime, giving home care workers overtime and minimum wage protections, and making it easier for subcontract and franchise workers to bargain collectively with parent corporations. But so far, there is little to protect workers in the exploding gig economy, whom companies treat as independent contractors. 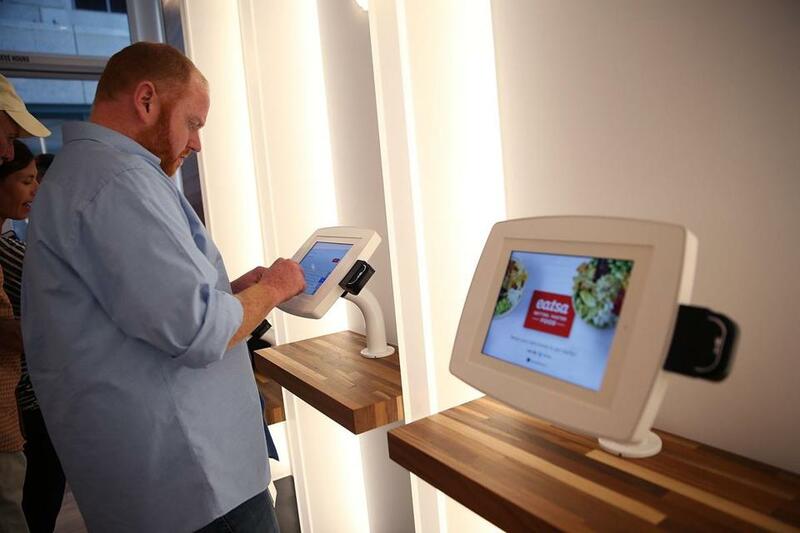 A customer uses an interactive kiosk to place orders at eatsa, a fully automated fast food restaurant in San Francisco.